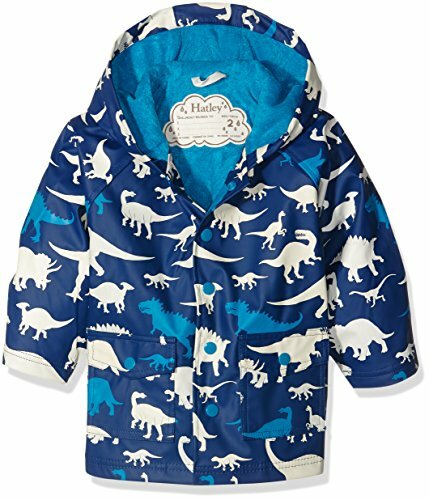 Silhouette Dinos Raincoat by Hatley. Cool Raincoat from Hatley’s rainwear collection featuring their Autumn/Winter 16 Silhouette Dinos print. This fabulous rain jacket has a soft cotton terry lining for comfort with easy popper fastenings and front pockets. The smart lining also means that the jacket looks great with the cuffs turned up for maximum wear. Hatley raincoats are 100% pvc free. The jacket is fully machine washable simply hang up to dry. Composition: 100% polyurethane outer coating with a cotton terry lining.